Welcome to The Rome Festival's 48th Anniversary! become the most creative artist you can be. Now is the best time to put together the patronage and support. SEND QUESTIONS AND REQUEST APPLICATIONS We recommend that you browse our website and visit your area of interest first. For over forty years the Rome Festival has offered artists from around the world the opportunity to study, perform, and live in the heart of the inspirational historic center of Rome. The artists perform in palace courtyards with the Rome Festival Orchestra, Opera, Ballet, Concert Chorus, and Chamber Music Ensembles. 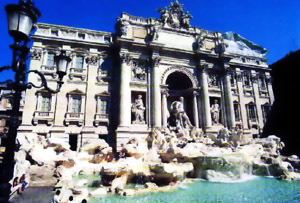 From their small hotels they can walk to the cultural treasures of Rome to learn how they inspired so many composers. The Rome Festival invites instrumentalists, singers, ballet dancers, designers, and volunteers from all regions, socioeconomic levels, and ethnic groups. Each summer artists come to the Rome Festival from all over Italy, the United States, and at least nine other countries. The high quality of the professional level performances helps the artists learn from each other and improve their future performances. After the Festival the artists network through each other for worldwide professional opportunities. The artists receive partial or total subsidy for their expenses from several sources: the Associazione "Rome Festival" in Italy, which sponsors the Rome Festival, the Rome Festival Orchestra Ltd., an American 501(c) (3) educational charity, as well as local grants, and contributions. Instrumentalist, opera singers, concert choral singers, and volunteers range in age from the early twenties to the early sixties. Ballet dancers range in age from mid teens to mid thirties. Young Artists in Rome singers, who perform with the Rome Festival Opera as a childrenï¿½s chorus and young people in the adult chorus, range in age from twelve to twenty.